Newly renovated 4 bedroom home minutes from the beach in leafy locality. Watch the sun set over the Great Dividing Range from one of the 3 patios, splash in the 9m heated saltwater pool and gaze at the southern stars while relaxing in the spa. 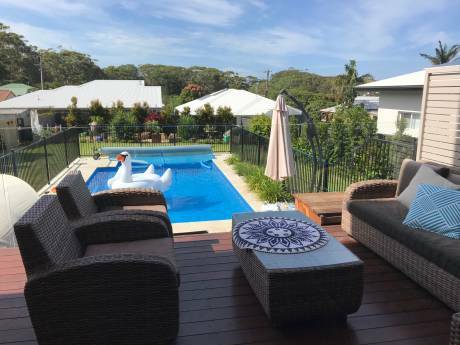 Large rear outdoor deck with barbeque overlooks shady yard which attracts birds, butterflys, possums and koalas. 5 pushbikes available for you to make use of local cycleways. Upstairs and downstairs TVs and DVD's. Kids will love the elevated cubby house among the trees, Playstation, trampoline, table soccer and downstairs playroom. 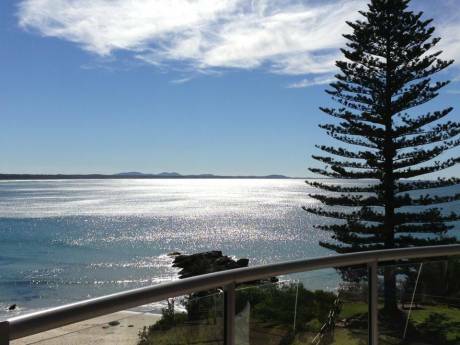 Port Macquarie is one of the true gems of the NSW coast. Originally a convict settlement, it has been described as the most beautiful coastline between Sydney and Brisbane, and is the only part of this coastal stretch where rainforest still meets the sea. Choose from 9 spectacular local beaches (swimming, surfing, snorkling, whale watching), fish or look for dolphins and sample oysters in the pristine Hastings River, explore nearby lakes or hiking trails in some of the many local national parks, choose from 4 local golf courses, or visit a variety of regional markets and wineries. Excellent local facilities mean that you have all the modern amenities you need without the congestion of places like Sydney, Brisbane or Gold Coast.